The Advisory Committee met Thursday, October 30, starting at 7:00 pm in the first floor south meeting room at Town Hall–conducting the last major set of reviews for the season. Brookline’s fall town meeting starts at 7:00 pm Tuesday, November 18, in the High School auditorium, reached via the side entrance at 91 Tappan St.
On the agenda were Articles 12, 13 and 19–restricting locations for medical marijuana dispensaries, sending zoning appeals notices to town meeting members and opposing by resolution a natural gas pipeline. The last two no longer seemed controversial. For notices, the Planning Department has instituted changes that satisfied the petitioners, and no action is expected at town meeting. The resolution seems likely to pass. The proposed zoning change for medical marijuana dispensaries previously got seven full-dress reviews by five boards and committees. All but the Advisory Subcommittee for Planning and Regulation recommended thumbs down. Nevertheless, the full Advisory Committee gave it an eighth review with 28 of the 30 committee members present, lasting over two hours. Only committee members Sumner Chertok and Pamela Lodish were not on hand. An audience of more than 30 listened, clearly divided between support and opposition. Proponents: In November of last year, after voter approval the previous year of a state law to allow marijuana distribution for medical use, Brookline adopted zoning to allow state-regulated dispensaries in general business, office and industrial zones. They require a special permit from the Zoning Board of Appeals. The boundary of a site must be at least 500 feet from the boundary of any school property. A building proposed for a dispensary may not contain a day-care center. Section 4.12 of Brookline’s zoning bylaw contains several other general restrictions and some procedural requirements. As at the other reviews, Gordon Bennett of Davis Ave. and the other petitioners for Article 12 argued that those restrictions are not enough. They claim a basis for their proposal in a regulation of the Massachusetts Department of Public Health, although it was clear to all that the state regulation does not apply to Brookline, because Brookline adopted its own regulations, as specifically allowed. Opponents: Opponents have argued that tightening zoning restrictions for locations as the article proposes would leave no site available in Brookline. A map from the Planning Department agrees. A divided subcommittee proposed excluding dispensaries from sites within “100 feet from a day-care center or 500 feet from any playground or park that includes a play structure.” At the Thursday review, however, subcommittee member Kelly Hardebeck of Precinct 7 backed away, saying she no longer supported additional zoning restrictions and leaving a 2 to 3 majority of subcommittee opposing the article. Review: The petitioners for Article 12 went through their now-familiar arguments, adding nothing new. Again, Dr. Elizabeth Childs of Walnut St., a physician, said she, along with other physicians belonging to the practice groups of the major Boston medical centers, would refuse to prescribe marijuana. Polly Selkoe, the assistant director of regulatory planning, said the board “can specify delivery conditions in a license.” In Newton, the City Council was said to be requiring amounts of more than an ounce to be delivered by courier rather than purchased over the counter. Several committee members described experiences of people whose ailments did not respond to conventional treatments but who obtained relief from some form of marijuana. A lawyer representing New England Treatment Access, seeking to open a dispensary at the former Brookline Bank site–located at the intersection of Boylston and Washington Sts.–said the firm will offer a comprehensive variety of medical marijuana products. The committee voted on two motions: a slightly revised proposal from the petitioners for Article 12 and the proposal generated by the subcommittee. Both lost by large majorities. The only committee members supporting any further zoning restrictions were Angela Hyatt of Precinct 5, Amy Hummel of Precinct 12 and Lee Selwyn of Precinct 13. Mr. Kanes abstained. The fall town meeting will hear from at least five boards and committees, all now on record opposing Article 12. A fantasy from the sponsors of Article 12 focused on arbitrage. Customers for medical marijuana, they claimed at several meetings, will buy it for $300 an ounce and sell it on the black market for $400 an ounce. No one challenged self-anointed “experts,” just as happened years ago with “Reefer Madness” promotions (1936) and a few decades of less charming successors. Since medical marijuana has to be grown and processed under controls and incurs taxes and overhead, a sensible person would expect it to settle in at higher prices than street goods. Legalization of marijuana by the states of Washington and Colorado provides above-ground comparison markets. A recent price survey by Philip Ross documents some effects, published by International Business Times–an Internet news site based in New York City. According to Mr. Ross, street marijuana sells in the U.S. at an average price of around $350 an ounce, but the price has fallen to about $240 in Washington and Colorado, where it competes with over-the-counter recreational and medical sales. Medical marijuana costs more there, he reports–around $300 an ounce. Where underground sales compete with above-ground markets, competition appears to have induced differential pricing. According to Mr. Ross, most medical grades are less potent in euphoric effects than street goods, while they cost more. Contrary to the claims from Article 12 sponsors, evidence from this source shows little arbitrage potential in medical marijuana. Instead, the products look more likely to remain specialties of interest to people with ailments that do not respond to other treatments. This entry was posted in Business, History, Licensing, Meetings, Public health, Regulations on October 31, 2014 by Craig Bolon. A regular meeting of the Board of Selectmen on Tuesday, October 28, started at 6:25 pm in the sixth-floor meeting room at Town Hall. In an earlier session, closed to the public, the board had agreed on a contract with the Teamsters local representing the police and fire dispatchers. There were two major reports about ongoing issues. There were public comments, reviews and recommendations for ten of the 20 articles coming before the town meeting that starts November 18. An ambitious agenda produced a session lasting nearly until midnight. Announcements, contracts and interviews: The Health Department provides flu clinics this season on October 29, November 9 and December 4 at Baker and Devotion schools and at the Health Center. The first day for a winter farmers market in the Arcade Building at 318 Harvard St. is Sunday, November 2, starting at 2 pm. On Wednesday, November 12, the Brookline Neighborhood Association and League of Women Voters host a forum for the November 18 town meeting. It begins at 7 pm in community television studios on the third floor at 46 Tappan St., the Unified Arts Building of Brookline High School. Topics are for Articles 8, 12, 13, 15 and 16: revising the disorderly conduct bylaw, restricting locations for medical marijuana dispensaries, sending zoning appeals notices to town meeting members and managing taxi medallions (that is, permanent licenses). Joe Viola, the assistant director for community planning, got approval to extend the duration of a contract with Vanasse Hangen Brustlin of Watertown for design of a road improvement project for lower Washington St. Planning began about nine years ago as part of a so-called “Gateway East” effort. Erin Gallentine, director of parks and open space, got approval to add $0.015 million to a masonry repair project at the Old Burying Ground on Walnut St., using funds already appropriated. The board interviewed candidates for appointments: one for Tree Planting, one for Economic Development and one for Diversity, Inclusion and Community Relations–created at this year’s annual town meeting to replace the former Human Relations/Youth Resources Commission. Twelve commissioners are authorized but none appointed yet, with some positions still awaiting applicants according to board member Nancy Daly. The board also decided to appoint a Noise Control Bylaw Committee, to be charged with proposing revisions to related town laws. Projects, licenses and permits At the request of Ms. Gallentine and the Dukakis Recognition Committee, established in 2011 through a town meeting resolution, the board approved a plaque dedicating the Riverway Park to Brookline residents Michael and Kitty Dukakis, the former 3-term governor and his wife. It will be stationed near the Longwood stop on the D branch of the Green Line, where Mr. Dukakis often boards. Hsiu-Lan Chang, who operates Fast Frame on Beacon St. in Washington Square, asked for permission to install a plaque on the Washington Sq. clock–a donation to the town about 20 years ago from Washington Sq. merchants–in honor of William T. Bonomi, a key supporter of efforts to install and maintain the clock. The board approved. A major maintenance effort is expected before year’s end by Electric Time of Medford, funded by area merchants. The board reviewed and approved alternate managers for alcoholic beverage sales at two locations, temporary licenses for two events and a 10 am Sunday starting hour for alcoholic beverage sales at six locations. The last, according to board member Betsy DeWitt, is an obligation under a recent state law when a license-holder requests it. Chen-Hui Chi of Chelmsford appeared to apply for a food vendor (take-out) license to continue operations for Hong Kong Cafe at 1391 Beacon St., which currently has a different owner. He was represented by a bilingual lawyer who translated the board’s questions to Chinese. The board wanted to make sure the applicant understood that the license did not authorize table service. Board members were satisfied and approved. Managers of Herb Chambers appeared for continued review of an inflammables permit for the Audi dealership at 308 Boylston St. A review on August 29 had left several matters to be settled. As before, the organization was represented by Robert L. “Bobby” Allen, Jr., a Brookline-based lawyer, Precinct 16 town meeting member and former chair of the Board of Selectmen. Mr. Allen told the board that the waste oil storage tank had been moved to a different location and would no longer be serviced via East Milton Rd., a previous source of neighborhood opposition. He said former underground tanks have been removed. KPA Environmental and Safety of Colorado is now overseeing environmental compliance. Mark Jefferson, deputy chief of the Fire Department, confirmed the progress but said the new tank installation was not finished. This time, despite some neighborhood objections, the board was satisfied that Herb Chambers was on track for a safe workplace and granted an annually renewed permit. Representatives of the VFW and American Legion post on Washington St. appeared again, seeking a club license for alcoholic beverages. They were represented by Roger Lipson, a Brookline-based lawyer and Precinct 14 town meeting member. The post held such a license from 1977 through 2010 but let it lapse by mistake, when a manager became ill. About two years ago, Elmon Hendrickson, a Brookline resident, took over as post manager. Mr. Hendrickson has been successful in building a clientele who use the post for events, including weddings and other celebrations, but this has caused friction with neighbors–evident at a previous hearing October 2 on the license application. This time, both Mr. Hendrickson and the board were more prepared. The board wanted some firm conditions on the license, to which Mr. Hendrickson agreed. There will be police details for events with over 50 participants, and there will be four post members on hand for events: two for service and two for security. The club will not operate past 11 pm. Video cameras and sound meters have been installed and will be monitored during events. Doors near abutters will be used during events only for emergencies. The parking lot will be used only by caterers. With these and other conditions, the board approved a new club license for the post, to be reviewed annually. Muddy River project: The board heard a report on the Muddy River Restoration Project from Thomas Brady, the conservation director, and Andrew Pappastergion, the public works director. The project began after a major storm in October, 1996, flooded the Kenmore Sq. transit station and many houses and buildings in Brookline and Boston. A disastrous 1958 decision by the Hynes administration in Boston to divert the river into relatively small culverts is now being reversed by excavation and by construction of large channels under Park Drive and Brookline Avenue crossings, near the former Sears now called Landmark Center. As Mr. Brady and Mr. Pappastergion explained, the current effort will correct only one blockage to river flow, although it is probably the worst one. A century-long buildup of silt and invasive plants obstructs many other parts of the riverway, from Ward’s Pond through the Fenway area. They said the U.S. Army Corps of Engineers, manager of the current project, is now willing to extend the project–provided it receives a Presidential order and Congressional funding. Board member Ben Franco said the Muddy River project was what got him involved in town government. Betsy Shure Gross, a Precinct 5 town meeting member, urged pressure on Congress for funding. “If we don’t maintain this river,” she said, “it will continue to be a significant threat.” The board agreed to participate in a campaign of letters from Boston, Brookline and several organizations. They will send a letter to the President. School construction: The board entertained a long report from Planning Board member Sergio Modigliani on the need for school construction. Mr. Modigliani felt that the needs were overstated, and he brought along a spreadsheet report trying to show why. According to his report, for kindergarten through eighth grade, the Brookline schools have, by different criteria, between about 600 and 850 unfilled seats. Class sizes this year range from 17 to 26 (Baker seventh grade). As has become well known, while school enrollments rose over the past several years, so did class sizes. William Lupini, the school superintendent, made similar points in a presentation to the board on October 7. However, Dr. Lupini’s view appears to be that maintaining high-quality schools is going to take more space, perhaps another elementary school plus some kind of high-school expansion. Mr. Modigliani, an architect, sought to discourage the board from supporting that approach, claiming that the unfilled seats in elementary schools will make more space unnecessary for at least several more years. However, he could not explain how to make use of the capacity, which is scattered through all eight schools and across all nine elementary grades, except by ordering students to transfer abruptly from one school to another. Board members seemed skeptical. Betsy DeWitt pointed out that several current classrooms have been squeezed into small spaces, labeled “suboptimal.” Mr. Modigliani agreed that was possible but said he had not been able to inspect any of them. Kenneth Goldstein, the board’s chair, challenged Mr. Modigliani’s approach, saying it would force schools to split siblings between schools. Board member Nancy Daly recalled events of years ago, saying, “My son was in a first grade of 27 kids. He didn’t learn how to read. That’s what catapulted me into town politics.” Mr. Modigliani seemed to focus on counting noses. The value of a seat in a classroom, he claimed, was about $100,000, but it turned out that he meant only costs of construction. He did not seem to have given much attention to the effects of increasing class sizes on the quality of teaching and learning. Warrant articles: The board voted to recommend no action on Article 1, unpaid bills, since there are none. For Article 2, collective bargaining, the board voted to recommend approval of the collective bargaining agreements reached with police officers earlier and with dispatchers the same evening. For Article 3, budget amendments, the board voted to recommend the Advisory Committee’s plan to use about 60 percent of an additional $0.04 million in state aid for the new diversity department, as proposed by Advisory member Stanley Spiegel and agreed to by the School Committee. The board voted to recommend approval of Article 7, bylaw amendments prohibiting discrimination on the basis of gender identity or gender expression in employment, housing, public accommodations, credit, lending and public education. The board had worked through these topics last August 29 with the participation of citizen petitioners for the article. As negotiated with the petitioner for Article 9, noise control bylaw amendments, the board voted to recommend referral to the Noise Control Bylaw Committee it will be appointing. For Article 10, commercial recycling, the board expressed support. However, board member Nancy Daly observed, “The business community is pretty unaware of this.” She asked petitioner Alan Christ, a Precinct 4 town meeting member, “Have you reached out to them?” Apparently unsatisfied with the answers, the board decided to wait for an analysis by the town administrator, Mel Kleckner, and did not vote a recommendation. The board gave the petitioners for Article 12, restrictions on locating marijuana dispensaries, another big bite of the apple, after spending almost two hours on the topic at a previous meeting. Not much was new. The issues had been hashed over the previous evening, at a meeting of the Zoning Bylaw Committee. Once again, George Vien of Davis Ave. tried to scare board members with vague threats of federal prosecution. Mr. Goldstein wasn’t buying any of that, saying, “I don’t think the federal government is going to hold the Board of Selectmen liable for voting no-action on a warrant article.” He then moved to recommend no action on Article 12. Board member Neil Wishinsky agreed, saying, “We can handle the concerns that people have through the licensing and appeals process.” The board voted unanimously to oppose Article 12. For Article 13, zoning appeals notices to town meeting members, the board also voted to recommend no action, after the Planning Department instituted changes that satisfied the petitioners. For resolution articles 18 and 19, support for domestic workers and opposition to a gas pipeline, the board voted to recommend approval, with amendments proposed by the Advisory Committee. This entry was posted in Business, Environment, Events, Grade schools, High school, History, Licensing, Meetings, Neighborhoods, Public health, Regulations, Services, Traffic on October 29, 2014 by Craig Bolon. The Zoning Bylaw Committee met to review proposed new restrictions on marijuana dispensaries Monday, October 27, starting at 7:30 pm in the first floor south meeting room at Town Hall. Article 12 for the November 18 town meeting proposes to exclude these facilities within five hundred feet of day-care centers and places where “children commonly congregate.” The committee had held a public hearing on the article September 22. Proponents: In November of last year, after voter approval the previous year of a state law to allow marijuana distribution for medical use, Brookline adopted zoning amendments to allow state-regulated dispensaries in general business, office and industrial zones. The use requires a special permit from the Zoning Board of Appeals, the property boundary must be at least 500 feet from the boundary of any school property and the building may not contain a day-care center. Section 4.12 of Brookline’s zoning bylaw contains several other general restrictions and some procedural requirements. At the committee’s hearing and at several other recent meetings, Mr. Bennett claimed Brookline should have followed regulations from the state’s public health department–adding exclusion zones around day-care centers and places where “children commonly congregate.” However, the petitioners for Article 12 quote selectively from state regulations. Opponents: The petitioners for Article 12 claimed that in Colorado half the prescriptions for medical marijuana had been written by a dozen physicians. One of the petitioners, Elizabeth Childs of Walnut St., showed how that might happen. Ironically, the statement from Dr. Childs, a physician, became an argument in opposition. Dr. Childs said she, along with other physicians belonging to the practice groups of the major Boston medical centers, would refuse to prescribe marijuana. That is likely to leave a small number of independent physicians as sole resources for patients interested in treatment. As in Colorado, a small number of physicians is then likely to write a large fraction of prescriptions, because of rigid attitudes adopted by other physicians. Eddie Benjamin of Brookline objected that petitioners for Article 12 wanted to ban marijuana dispensaries by leaving no place for one to locate. Maps prepared by the Planning Department confirmed that locations of parks, playgrounds and child-care facilities in Brookline were so numerous and widely dispersed that no part of a general business, office or industrial zone would remain as an eligible site. New England Treatment Access (NETA), now headed by Arnon Vered of Swampscott, proposes to use the former Brookline Bank building at the intersection of Boylston and Washington Sts. Mr. Vered argued that it is one of the few suitable sites in Brookline: an isolated, single-use building in a general business zone, on a state highway with on-site parking, close to a transit stop on Station St. According to Polly Selkoe, the assistant director of regulatory planning, the Brookline Bank location is an eligible site under current zoning, and NETA has filed a plot plan that freezes the zoning for its site. Under those conditions, even if town meeting were to pass Article 12 as submitted, NETA would be able to use the site as long as it began operations within three years from filing the plot plan. Review: Committee members found claims advanced for Article 12 unconvincing. Linda Hamlin, who chairs the Planning Board, said there was “no evidence day cares are put in jeopardy.” Kenneth Goldstein, who chairs the committee and the Board of Selectmen, said, “Voters in Brookline have spoken clearly…The bank is about as good a location as we could find in this town.” The committee voted unanimously to oppose Article 12. This entry was posted in Business, Elections, Grade schools, High school, History, Neighborhoods, Parking, Public health, Regulations, Services, Traffic on October 28, 2014 by Craig Bolon. On Saturday, October 25, the Brookline Educators Union (BEU) and Citizens for Public Schools (CPS) of Boston jointly sponsored a forum on regimented school testing, starting at 10 am in the Unified Arts Building at Brookline High. The forum featured live experiences with some of the PARCC tests proposed for use in Brookline schools. Participants included Brookline students, parents and teachers and Boston teachers. For this school year, after reviews and public comment, the Brookline School Committee decided against PARCC tests. Resistance movements: Citizens for Public Schools, founded in 1982, is participating in some resistance movements against charter schools and regimented testing in public schools. Board member Alain Jehlen represented CPS at the Brookline forum. Earlier in the year, he helped organize a forum on charter schools at Madison Park High School in Boston and a forum on high-stakes testing in Northampton. This year has been a watershed for resistance to regimented testing in public schools. A national movement has been organized by United Opt Out of Miami, FL, and it is starting to have effects. Over half the students recently refused testing at several schools in cities of New York, which has switched to PARCC tests. Last year Minnesota repealed its testing program for high-school graduation. According to the FairTest organization in Cambridge, this year Alaska and South Carolina repealed their programs and awarded diplomas to students who would have graduated in previous years except for test scores. Indiana, South Carolina and Oklahoma repealed federally promoted Common Core standards and related testing. Rhode Island enacted a 3-year moratorium on test scores as a graduation requirement. CPS is calling for a similar moratorium in Massachusetts. PARCC tests: At the recent Brookline forum, most participants investigated PARCC tests using computers in one of the teaching centers, led by Jessica Wender-Shubow, president of the Brookline Educators Union. They can also be investigated with practice tests on the Web. Dr. Jehlen described regimented tests as a source of revenue for test publishers and equipment makers. PARCC is fundamentally computer-based. Many schools, he said, will “buy machines that will fit the test,” whether or not they are otherwise useful. However, he went on, “there’s been so much push-back that Massachusetts may stay with MCAS,” as Brookline chose to do this year. Reactions: After the session with PARCC tests, Jennifer Rose-Wood, a BEU board member, led a discussion. According to several participants, the PARCC user interface was awkward for experienced users of both Windows and Macintosh computers. It does not follow familiar patterns of either operating system. A Devotion parent who introduced herself as Hillary said the third-grade language test was “really hard.” She criticized an “infantile story” shown as a basis for questions and said if PARCC tests are used in Brookline schools, she wants to opt out. Will, who teaches geometry at Brookline High, said the PARCC geometry test involved “chained problems, much harder than the SAT,” and the “level of language was pretty sophisticated.” Despite a background as a former textbook editor at Houghton-Mifflin, he found could not disentangle problems without using graph paper. Barbara Scotto, a School Committee member who formerly taught fifth and sixth grade at Driscoll, described how she had been confused by the PARCC user interface. “My goal is to get testing that is fair for the students, that doesn’t take up huge portions of time,” she said. “It concerns me that a state official is on the board of PARCC…that is hugely concerning.” She was obviously referring to Mitchell Chester, the commissioner of education, who chairs the PARCC board–an apparent conflict of responsibility. This entry was posted in Events, Grade schools, High school, Regulations on October 27, 2014 by Craig Bolon. Massachusetts highway bridges, sometimes reported as worst in the U.S. during the 1980s, have been improving slowly. About 10 percent are now reported structurally deficient, compared with an average of about 11 percent for states across the country. Pennsylvania has become the most problem-ridden state, with about 23 percent of its bridges structurally deficient. Trends: Massachusetts bridge improvements have been a bipartisan effort. Progress occurred during the Weld, Cellucci, Swift, Romney and Patrick administrations. The number of bridges rated structurally deficient has dropped from around 800 in the late 1980s to a little over 400 now. The state’s Executive Office of Transportation publishes information for 1996 through 2013 on its Web site. Most improvements before the Patrick administration occurred on the cheap, renovating many smaller and simpler bridges but deferring work on bigger, more complicated ones: the Tobin, Longfellow, Fore River and Braga. One of the few ambitious efforts from 1991 through 2006 was renovation of the double-deck O’Reilly Bridge over the Merrimack River on I-495 in Lawrence and North Andover, multiple projects lasting about 8 years at a cost of over $50 million. Among the rare exceptions to scandalous costs of antique bridge renovation was the 1888-1891 Harvard Bridge for Massachusetts Route 2A across the Charles River, Massachusetts Ave. between Boston and Cambridge. In the 1980s, a major renovation project cost about $16 million, on-time and on-budget. As compared with other renovations of antique bridges, the advantage–around tenfold in cost for the size of the bridge–was robust engineering and reliable construction, both when built and when renovated. Restoring a fragile antique: The Longfellow Bridge was structurally deficient the day it opened. That’s what often happens with public works primarily designed by architects rather than engineers. The pretentious ten granite piers and eleven steel-arch spans, extending for 1,800 feet, were designed around 1897 to carry trains as well as horse-drawn vehicles and emerging motor vehicles. The four cigar-stub towers were never anything but fake Victorian ornaments. At the time, although the Back Bay had been filled, the lower Charles River had tidal mudflats and garbage dumps. Shortly after the bridge opened in 1907, what is now known as the Science Park dam turned this part of the river into a catch basin for raw municipal sewage and industrial waste. Near the bridge, a bed of infectious and toxic river-bottom sludge has accumulated, up to six feet thick. However, the greatest misfortune of the Longfellow was that the complex, badly engineered structure came under custody of the former Metropolitan District Commission. The MDC proved an even worse steward of the Longfellow than the Port Authority became of the Tobin. Unlike the Harvard Bridge, the Longfellow had not been designed to withstand careless management. In 1959, the bridge got a first overhaul under the MDC, by then a patronage-ridden agency in decline. The job was botched, failing to address complexities of the structure, and after several years the Longfellow again fell into severe disrepair. The Longfellow was an obvious candidate for demolition and replacement. However, in 2003, the Longfellow went to an unprepared Department of Conservation and Recreation. The DCR had been taken over by antiquarians, who became determined to preserve not only the shapes of the elements but also the structurally inadequate, badly corroded and fractured original materials. Haggling over design added ten years of delay to a project only starting in 2013. A new bridge, perhaps a modern design like the Zakim, might have cost half as much and would be likely to last at least twice as long. This entry was posted in History, Projects, Transportation on October 24, 2014 by Craig Bolon. The Board of Selectmen held two October hearings on potential tax overrides for next year, both in the sixth floor meeting room at Town Hall. The first was Thursday evening, October 9, starting at 7:30 pm, and the second was Monday morning, October 20, starting at 9:00 am. Each hearing drew about 80 participants and listeners. Perhaps the board expected differences between morning and evening, but views expressed proved similar. Public schools: The key problem is costs of Brookline public schools. That is driven mostly by enrollment, which has increased for at least six years. On August 13, 2013, the board appointed an override study committee to review the issues and make recommendations. The committee divided into 9 subgroups, holding 174 officially posted meetings over almost a year. It voted recommendations last July 30. At the final meeting, committee member Sergio Modigliani moved to recommend $5.0 million per year in additional property taxes to support town operations and a one-time exclusion from the tax limit for $23.0 million in debt to renovate and expand Devotion School. Committee member Kevin Lang moved to amend: $7.9 million additional per year for operations and a $58.8 million debt exclusion for school construction. The committee decided to vote the matters separately. Prof. Lang’s amendments failed, 7 to 8. Mr. Modigliani’s motions passed, 9 to 6. They became the committee’s recommendations to the Board of Selectmen. The Brookline TAB did not send a reporter to that meeting and failed to describe committee actions as they happened, saying instead there was “no consensus.” Indeed there was no consensus, but there were votes. Factions: Recently, some members of the Board of Selectmen have begun mentioning “group 1″ proposals–meaning the committee’s recommendations from June 30–and “group 2″ proposals–meaning ones for higher amounts that the committee rejected. Of the nine committee members in the majority, five spoke at the hearings: Clifford Brown, Chad Ellis, Janet Gelbart, Carol Levin and Lee Selwyn, supported by co-chair Richard Benka. Of the six members in the minority, only Beth Stram spoke. Many speakers described affiliations, including Brookline High School (BHS), an elementary school–Baker, Devotion, Driscoll, Heath, Lawrence, Lincoln, Pierce or Runkle–service as town meeting members (TMM) or on the override study committee (OSC), and the Brookline Educators Union (BEU). Maximum override: Dr. Lupini has outlined a spending plan he says would require an additional $12.29 million in tax revenue for fiscal years 2016, 2017 and 2018 combined. He did not make clear his base of comparison, but apparently he is somehow calling for more than $15.38 million in added revenue that the override study committee recommends for those years, including 2.5 percent increases for 2017 and 2018. At the hearings, Dr. Lupini’s plan was generally supported by Jessica Wender-Shubow, BEU president and a BHS teacher, by Dominique Aumiller, BEU vice president, a BHS teacher and a Devotion parent, by Emily England, a Baker parent, by Keira Flynn-Carson, a BHS teacher, and by Mike Toeffel, a Devotion parent. High override: Last June 30, a minority of the override committee proposed higher amounts than those the override study committee recommends: $7.9 million per year for school operations, plus debt exclusion of $58.8 million for school building projects. Some members of the Board of Selectmen have been referring to those as “group 2″ proposals although they were rejected. They have no status as recommendations. At the hearings, the high override was generally supported by Lauren Bernard of John St., a Devotion parent and Precinct 8 TMM, by Sarah Boehs of Aspinwall Ave., a Lawrence parent, by Jack Hall of Washington St., a Driscoll parent, by Brian Hochleutner of Elm St., a Pierce parent and Precinct 6 TMM, by Hai-ying Peng of Bradford Terrace, a Devotion parent, by Pamela Roberts, a Devotion parent, by David Root of Longwood Ave., a Lawrence parent, by Andrew Shalit of Griggs Terrace, a Pierce parent, by Beth Stram, a BHS parent and an OSC member, by Jillian Webster of Naples Rd., a Devotion parent, and by Charla Whitlay, a Devotion parent. Low override: A compromise approach is the lower override that was recommended by the committee on June 30: $5 million per year for school operations plus debt exclusion of $23 million for expansion and renovation of Devotion School. The committee acknowledges, if enrollment continues to increase, that more funding may be needed in future years. At the hearings, the low override was generally supported by Richard Benka of Circuit Rd., co-chair of OSC, by Clifford Brown of Hyslop Rd, a Precinct 13 TMM and an OSC member, by Chad Ellis of Chesham Rd., a Runkle parent, a Precinct 12 TMM and an OSC member, by Janet Gelbart of St. Paul St., an OSC member, by Carol Levin, a Runkle parent and an OSC member, by Linda Olsen Pehlke of Browne St, a Precinct 2 TMM, by Dr. Nadhave Prakash of Bradford Terrace, by Lee Selwyn of Reservoir Rd., an OSC member, by Dr. Stanley Spiegel of Stetson St., a Precinct 2 TMM, by Dr. Sundar Srinivasan of Salisbury Rd., a Driscoll parent, and by Megan Zorn, a Driscoll parent. Some override: Some speakers at the hearings voiced support for an override without saying which option or what amounts they favored. They included Cina Doctoroff of Williston Rd., a Runkle parent, Craig Hagen of Colbourne Crescent, a Runkle parent, Pamela Katz of Columbia St., a Devotion parent and Precinct 9 TMM, Ellen Messing of Kilsyth Rd., a Driscoll parent, and Carrie Staff of Stedman St., a Devotion parent. Support for METCO and employee programs: Starting in December of last year, Mr. Selwyn and Mr. Benka of the override study committee began singling out METCO and the student program for town employees as villains of school spending. Mr. Selwyn introduced the issues at a meeting attended by Jessica Wender-Shubow, a native of Brookline who now heads the Brookline Educators Union. Word quickly got around that Brookline had a committee with members hostile to two of the community’s longstanding social programs. METCO was organized in 1965. An initial effort was led by Prof. Leon Trilling of M.I.T., then chairman of the Brookline School Committee. Key participants included Dr. Robert Sperber, then Brookline superintendent of schools, and the superintendents in Newton and Lexington. When METCO started sending students to seven founding communities in 1966, the program was described as filling “available seats” in classrooms. In the 1970s, a similar approach was taken to a student program for town employees, who have been allowed to enroll their children in Brookline schools, paying a so-called “materials fee” to compensate for direct costs. Students in these programs do not get their choices of school. Instead, they are assigned where space is most available. Because of the approach, school administrators have always maintained that the main costs are not financial but social, increasing some class sizes. At the hearings, Brookline’s longstanding social programs in the schools were generally supported by Joanna Baker of Beacon St., a Precinct 13 TMM, by Suzanne Farman of Centre St., a Devotion parent, by Eana Meng, a BHS student and founder of Brookline Friends of METCO, by Ellen Messing of Kilsyth Rd., a Driscoll parent, by Danielle Rabbina, a BHS teacher, by Joseph Segel of Beacon St, by Dr. Min Song of Bradford Terrace, a Devotion parent, by Suzanna Stern, a Runkle parent, by Henry Varon, a BHS student, by Ms. Wender-Shubow and by Catherine Wolf, a BHS teacher. Speaking about the employee student or so-called “materials fee” program, Ms. Miller said it “encourages and retains high-quality teachers.” Ms. Rabbina, a 14-year veteran in Brookline schools, said that if the program were compromised, she “would look elsewhere.” According to Ms. Wender-Shubow, “teachers are demoralized” from the committee’s attack against the employee program. “You are talking about sustaining middle-class families,” she said. Devotion School plans: The current plan for Devotion School made three residents of Bradford Terrace unhappy. That is an apartment building on Babcock St. without the side and rear setbacks now required by zoning. Maya French complained that the Devotion School Building Committee chose “the most expensive plan for Devotion.” However, the committee obtained two sets of cost estimates. While the option they chose was the most expensive of three according to one estimate, it was the middle of three according to the other estimate. Since no one but residents of Bradford Terrace was complaining about Devotion School plans, the real issue looked to be something else. An initial plan for a proposed new south wing is closer to Babcock St. than the current building. From Table 5.01 of the zoning bylaw, the minimum setback appears to be around 50 ft–about the current amount. The initial plan showed a new south building set back about half as much. Under a special permit, which might be needed, the Zoning Board of Appeals can modify setback requirements. New, ninth elementary school: Some parents had concerns about plans for school expansion, to accommodate increasing enrollment. A few years ago, Brookline engaged in a tedious examination of the issue, resulting in an “expand-in-place” strategy for which the current Lawrence School project and the planned Devotion School project are the first outcomes. These fail to meet even current needs for elementary schools, accommodating at most a few hundred more students, and they do nothing for the high school. High school expansion: Lack of plans to address overcrowding at the high school, expected as the current, large elementary classes move up, concerned several parents. They included Emily England, a Baker parent, Robert Liao, a Heath parent, Dr. Min Song, a Devotion parent, Beth Stram, a BHS parent and an OSC member, and Megan Zorn, a Driscoll parent. This entry was posted in Elections, Grade schools, High school, History, Meetings, Taxes on October 21, 2014 by Craig Bolon. The Ebola virus epidemic in west Africa presents a complex picture in early fall, 2014. Guinea, Liberia and Sierra Leone remain in crisis. There is also a smaller epidemic in Democratic Republic of Congo, and several cases have been reported in Nigeria and Senegal. A few cases were imported into the U.S. and Europe, and the disease has been transmitted to health-care workers there. The World Health Organization (WHO), an arm of the United Nations based in Geneva, published most of the data available. It has offices in all the countries and operates longstanding efforts to report and combat chronic and epidemic diseases. The U.S. Centers for Disease Control and Prevention (CDC), based in Atlanta, has been issuing reports trying to estimate trends in WHO data but has only a little information of its own. Through late summer, WHO published data about the 2014 west Africa outbreak of Ebola virus via its Global Alert and Response (GAR) reports. This year GAR also described outbreaks of avian flu, MERS and polio and announced a recent outbreak in Uganda of Marburg–a virus closely related to Ebola. At the end of August, WHO began a series of Situation Reports focused on the 2014 Ebola crisis countries. Chart of case counts: The development of Ebola in the 2014 crisis countries of west Africa can be most clearly described with a semilogarithmic chart, an ordinary tool for research scientists. The chart shows total Ebola cases reported, by day of 2014, for the three countries in crisis. Counts of cases are measured through base-2 logarithms. An increase of one unit in a base-2 logarithm represents doubling of a count. The number of days for such an increase is the doubling time. When a logarithmic series of total cases climbs steadily, an outbreak is uncontrolled. When a trend levels, an outbreak is usually being controlled. Reports from west Africa began late, only after at least 50 to 80 cases per country had accumulated. It looks likely that the first cases occurred several months before the first WHO reports. According to CDC, the first confirmed case from the current epidemic can be traced to Guinea, in December, 2013. Crisis countries: Guinea reported Ebola cases first, on March 22. It acted with some success to control the outbreak through isolation of victims in care centers and supportive treatments. However, as the blue-colored series in the chart shows, Guinea has suffered successive waves of Ebola virus disease. In early August, a new wave began in and near Conakry, the capital, which has yet to be controlled. Sierra Leone began to report Ebola cases June 1. Extending the case-count trend back to logarithm zero–that is, to one case–suggests the epidemic there really started in early February. Sierra Leone has been less successful than Guinea with control efforts. The green-colored series indicates a shorter doubling time. Liberia began to report Ebola cases June 16. Extending its case-count trend suggests the epidemic there really started in early April. Liberia has shown the least success controlling the epidemic. Through July and August, the magenta-colored series indicated a doubling time of less than 20 days. Trends: Since August, the trend in Liberia from WHO reports looks to have leveled, but its crisis is not really being addressed, and those reports acknowledge that current data are not reliable. Instead, Liberia’s health-care and reporting resources have failed. In early August, news reports showed dead Ebola victims lying in streets. In early September, Liberia’s government admitted victims were being turned away from care centers, after that had been reported for weeks. The trend line for Liberia from July and August predicts more than ten thousand Ebola cases by now, while the latest WHO report shows a little over four thousand. So far, trends indicate no crisis country has brought the epidemic under control. The three differ in rates of increase: the most unfavorable is Liberia, with a doubling time probably still less than 20 days; the least unfavorable is Guinea, with a doubling time around 45 days. Responses: So far, only the United States government has begun substantial assistance. President Obama requested and Congress approved over $1 billion in assistance, using funds already appropriated. At last report, the U.S. Army had over 500 troops in Liberia of about 4,000 committed, was training more for service at a rate of about 500 per week and had committed equipment and materials to build and supply 17 treatment centers there. Note: Staff of the World Health Organization gathered and published data referenced for this article, but apparently they did not chart their data, or they ignored what a chart should have shown. This entry was posted in Events, Public health on October 19, 2014 by Craig Bolon. Actually, the area looks like a highway. It sounds like a highway, and it smells like a highway. It is a 6-lane state highway. The businesses actually located on the foot of Washington St.–then and now–consist of a Gulf station and a vacant restaurant, formerly Skipjack’s. Even the name of the project begged a question: to what might the industrial foot of Washington St. be a gateway? To a gas station? To a Boston ghetto? Not to a fish restaurant. Skipjack’s sagged with the dot-com boom, and the once lively Brookline site closed, soon followed by nearby, former Village Fish. Scarce goods: Ingredients for success went missing from the start and were never found: the “why” and the “what.” The launch plan merely outlined an area–centered on the segment of Route 9 along the foot of Washington St. It connects with a dilapidated stretch of Huntington Ave. in Boston, past the Riverway. In April of 2005, a citizen committee was assembled by a former town administrator, Richard Kelliher, and a former all-male Board of Selectmen–Robert Allen, Jr., Joseph Geller, Gilbert Hoy, Michael Merrill and Michael Sher. According to Brookline’s municipal Web site, the committee is still on the books, but it has no spot on the Agendas and Minutes page, covering meetings during 2010 through 2014. Time rolls on: With miracles in short supply, a practical Engineering division of Public Works eventually reverted the project to core elements: repaving a quarter mile of Route 9 and intersections, adding a touch of landscaping, building concrete traffic islands and modernizing signals and controls with pedestrian buttons, vehicle detection and emergency pre-emption. It’s a road plan, with no bicycles currently in view. As prepared by Vanasse Hangen Brustlin of Watertown and submitted to the state highway department January 18, 2012, project 605110 is strictly highway-issue. Travel lanes are mostly 11 feet, sidewalks are 6 feet, There is granite curbing and a little brick edging. An “existing pedestrian bridge” is called out, to be “removed by others.” Site-edge improvements in the Pearl St. vicinity are called out, to be “redevelopment by others.” Other than a couple of benches perhaps, there is no “boulevard” currently in view. Declare victory: Owing nothing to “gateway” dreams, Planning staff soldiered on with practical aims too, and fortune was with them. Children’s Hospital had bought out the 1990s Pearl St. development put up by Harvard Pilgrim and was interested in building offices next door. 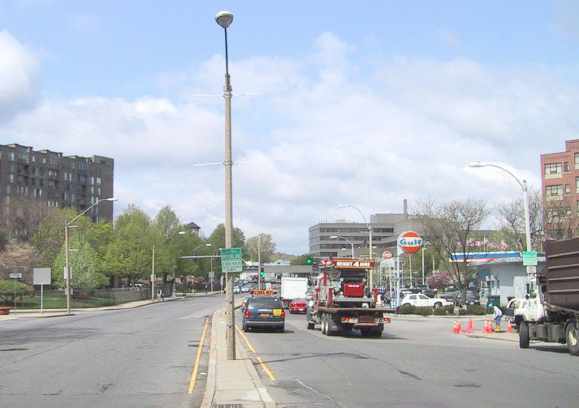 Brookline had sought developers since the 1960s, but the area to the north of the foot of Washington St. did not gel. Hearthstone Plaza went up in the early 1970s, then 1 Brookline Place in the middle 1990s, leaving a gap between, in Brookline’s former industrial zone. Learning of Children’s interest, the Board of Selectmen set up a Brookline Place Advisory Committee in October, 2013, and this time pieces began to fall into place. After the Brookline Place committee negotiated a scale of development and helped enact zoning at this year’s annual town meeting, the Planning Board recruited committee members for a design advisory team, following Brookline’s zoning process for design review. The team started work with the developers in August. • A demand-cycled pedestrian crossing on Route 9 near Pearl St.
Beautification, bicycles and a “boulevard” will have to wait. This entry was posted in Development, Environment, History, Projects, Traffic on October 17, 2014 by Craig Bolon. A regular meeting of the Board of Selectmen on Tuesday, October 14, started at 6:30 pm in the sixth-floor meeting room at Town Hall. There were no reports from departments or organizations. There were reviews, public hearings and recommendations for 10 of the 20 articles coming before the town meeting that starts November 18. Announcements, contracts and interviews: The Health Department provides flu clinics this season on October 28 and 29, November 9 and December 4 at the Senior Center, Baker and Devotion schools, and the Health Center. Public Works and Planning administrators got approvals for a total of $0.05 million in contracts, the largest of them with Robicheau of Roslindale for work at Waldstein Park. The board interviewed several candidates for appointments: two for Arts, one for Public Health Advisory, one for Naming and three for Diversity, Inclusion and Community Relations–created at this year’s annual town meeting to replace the former Human Relations/Youth Resources Commission and recently approved by the state’s attorney general. Twelve commissioners are authorized, none appointed yet. Warrant article, disorderly conduct: Article 8 for the November 18 town meeting, submitted by Daniel O’Leary, the chief of police, seeks to revise Brookline’s bylaw on disorderly conduct. An earlier review September 30 left unanswered questions from members of the board. This time Mr. O’Leary was assisted by Patricia Correa, an associate town counsel, and by town meeting members long interested in the issues. Mr. Rosenthal recalled the circumstances of the 1977 case and recommended to the board that the proposed bylaw would be effective and defensible. He was supported by Nancy Heller, a Precinct 8 town meeting member who had raised issues during a 2013 town meeting debate over the bylaw. This time the board seemed satisfied that lingering issues had been addressed and voted unanimously to recommend Article 8. Warrant article, noise control: The board heard from Fred Lebow, a former town meeting member, about Article 9, in which he proposes revisions to Brookline’s noise control bylaw. It is the same proposal that was rejected at this year’s annual town meeting in a unanimous vote of No on a main motion–a very rare event. Mr. Lebow, an acoustic engineer, still wants to make life easier for fellow engineers by exempting them from night-time work–instead, estimating night-time noise by adjusting the amount of noise measured during the day. Mr. Lebow tried to convince the board about his approach by showing that the bylaw already uses a similar approach when measuring noise from “fixed equipment,” but it sounded like a tough sell. Mr. Lebow also wants to allow noise meters that are calibrated to European (IEC) standards rather than to U.S. (ANSI) standards. He claimed they are “the same,” but they are not. According to Pulsar Instruments, a dealer in precision sound equipment, “USA standards…are usually VERY different…[from] IEC standards and are often incompatible.” It came out that one of Mr. Lebow’s problems is that he happens to own a European meter. Celinda Shannon, who became executive director of the Brookline Chamber of Commerce about a year ago, spoke in support of commercial recycling. However, she said she was “concerned with practical and financial issues.” Board member Betsy DeWitt recalled, at the time of the “plastic bag ban…[last year], discussions about implementation plans.” “That’s right,” responded Ms. Shannon. Mr. Pappastergion said he was wary of trying to take on too many solid-waste issues in short order. As he put it, “We’re going to be requiring a very large culture-change in the community.” Last May 14, at the complaint session DPW holds before an annual town meeting, Mr. Pappastergion had announced a trash metering proposal, which he also described at a June 10 meeting of the Board of Selectmen. Alison Steinfeld, the planning director, said some problems had already been addressed. If an Appeals panel now grants a continuance, it is to a “date certain” announced at the hearing where the continuance is granted. She said “minutes” of Appeals sessions were being made available online. When board member Betsy DeWitt looked up a recent case on the spot, using a portable computer, she found no such thing. Ms. Steinfeld seemed to back away, saying there was “a summary of the prior night’s meeting on the Web site.” There are no minutes online now. The online records just say, in general, what type of development was being proposed–such as “basement expansion” or “house addition”–and whether an appeal was granted or denied. The online records do not say who sat on an Appeals panel, who spoke at a hearing or what they said. They do not even describe special permit and variance requests–such as 3 feet less rear setback than required under Table 5.01 for an accessory structure in an S-7 zone. If conditions are imposed, they do not tell what the conditions are. Ms. Steinfeld promised improvements. Warrant articles, naming and resolutions: The board voted to recommend no action on Article 14, naming part of Cypress Playground as Hennessey Fields, and instead to recommend an alternative filed for a “special-special” town meeting, also scheduled for November 18. The board voted to support Article 17, a resolution asking the town to select health-conscious LED lamps for its lighting programs. It had heard arguments at a public hearing October 7. Stephen Vogel of Walnut St. spoke for Article 18, proposing a resolution in support of the rights of domestic workers. He previously described it at length to an Advisory subcommittee. Edward Loechler, a Precinct 8 town meeting member, and Carol Oldham, a Precinct 11 town meeting member, spoke for Article 19, proposing a resolution against natural gas pipelines and explorations in Massachusetts. Article 19 has oddities. Natural gas, it claims, “is a non-renewable fossil fuel which generates significant carbon emissions.” The proponents cited no renewable fossil fuels nor any ordinary substance that does not produce carbon [dioxide] emissions when burned. 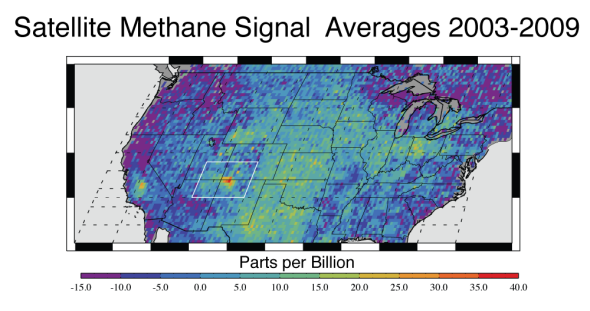 They appeared unfamiliar with recent research showing the U.S. distribution of atmospheric methane spiking in the Southwest but very low in New England. Board member Ben Franco seemed skeptical. Without natural gas, he asked, “Can renewable energy fill the gap?” Dr. Loechner maintained there was unused capacity in existing gas pipelines but did not distinguish between average and peak demands. Ms. Oldman mentioned transport of liquefied natural gas on ocean-going ships but did not explain that much energy has to be spent on liquefaction. The article sounded in need of study. This entry was posted in Business, Environment, Meetings, Public health, Regulations, Services, Transportation on October 16, 2014 by Craig Bolon. A special Advisory subcommittee met for a public hearing Tuesday, October 14, starting at 5:30 pm in the Denny Room at the Health Center. It was assembled by Advisory chair Harry Bohrs to review two articles about taxi medallions filed for the town meeting starting November 18. The subcommittee consists of Advisory members Amy Hummel, Sytske Humphrey, Fred Levitan and Michael Sandman, with Mr. Sandman as chair. The topic became a renewed controversy when John Harris, a Precinct 8 town meeting member, filed Article 26 for this year’s annual town meeting, proposing to ask the General Court to repeal sections of state laws allowing Brookline to sell taxi medallions: in Chapter 51 of the Acts of 2010 and in Chapter 52 of the Acts of 2012. The town meeting voted to refer his article to a committee to be appointed by the moderator. Medallions are permanent taxi licenses that are owned as property and can be resold. Like most towns, Brookline has annually renewed licenses. The Transportation Board began to consider a medallion system several years ago. A November, 2008, town meeting voted to ask for state legislation authorizing such a system. It took four years to get satisfactory legislation and two more years to develop plans and regulations. If Mr. Harris had not filed Article 26 or it had been rejected, a medallion system would have been implemented by this past summer. The moderator’s committee on taxi medallions met over the summer. It consists of Mr. Sandman along with Chad Ellis, a Precinct 12 town meeting member, Jeffrey Kushner, a Brookline resident, and Joshua Safer, a Precinct 16 town meeting member and current Transportation Board chair. Thus the moderator’s committee and the Advisory subcommittee share one member, and both are being steered toward Transportation Board viewpoints. Mr. Harris refiled the article seeking repeal of taxi medallions, now Article 15 for the fall town meeting. Like all business coming before a town meeting, it will be reviewed by the Advisory Committee, who first send it to a subcommittee. Mr. Sandman and Mr. Levitan of the subcommittee are former Transportation Board members. In an explanation filed with his article, Mr. Lescohier complains that plans for taxi medallions approved by the Board of Selectmen have “practically earmarked medallion sales only to established companies,” ignoring “disgraceful, deteriorating working conditions” for taxi drivers and providing no “realistic opportunity for [them to become]…owners” of medallions. Mr. Levitan moved to recommend no action on Article 15, seeking to repeal taxi medallions, which won unanimous support. Mr. Sandman moved to recommend approval of Article 16, the resolution, but Ms. Humphrey sought to amend, recommending it be referred to the moderator’s committee. After some discussion, the amendment won unanimously. The Advisory Committee may or may not support its subcommittee’s approach. In any event, decisive actions that Mr. Ellis, Mr. Kushner and Capt. Gropman urged were not getting through this subcommittee, who recommended yet another turn of the churn. This entry was posted in Business, History, Licensing, Meetings, Transportation on October 15, 2014 by Craig Bolon.